Click here to register for the 2019 Annual Assembly with Ray Suarez. Clifton L. Taulbert addresses the 2018 Annual Assembly crowd. Nearly 200 people gathered on Thursday, May 10, for Interfaith Action of Greater Saint Paul’s 2018 Annual Assembly. Our new venue this year was spectacular: the Klas Center at Hamline University. We were thrilled to be welcomed to the beautiful space by Sandy Klas, whose founding of The Arc in Minnesota has improved the lives of people with disabilities and their families in myriad ways. Her welcome kicked off a spirited, hopeful evening with music by the talented Walter Chancellor Jr. and Brian Nielsen from Twin Cities Mobile Jazz Project. The Honorable Lucinda Jesson, who serves on Interfaith Action’s board of directors, served as emcee. Daisy and Coco Leonard from Interfaith Youth Connection offered their heartfelt and unique prayers. The Report to the Community multi-media presentation highlighted the impact supporters of Interfaith Action made possible in 2017, from meeting vital needs to providing quality, culturally relevant after-school enrichment, from packing 550 backpacks with supplies for success to helping 252 people prevent diabetes, and from launching the first cohort of Opportunity Saint Paul volunteers to providing 215 interfaith youth with leadership training and service opportunities. Bruce Nerland, president of the Interfaith Action board, paid respect to retiring board members Betsy Keyes and Rev. Norma Rae Hunt. Those in attendance then voted to renew the terms of Sharon DeMark, Kirk Kleckner and Rev. Javen Swanson, and elect new board members Diane Benjamin, Suzanne Kelly, and Fr. Erich Rutten, plus Dr. David Misemer to the Interfaith Action Foundation board. Board member Louis André Fischer presented the Interfaith Progress Award to Rev. Dr. Thomas Duke for his many years of leadership of the Saint Paul Area Council of Churches and Saint Paul Interfaith Network. Ken Crea from the Catholic Church of Corpus Christi received this year’s Bringing Faith to Life Award for his extraordinary contribution to faith-based poverty relief in the Twin Cities. Kristi Anderson, Interfaith’s long-time Director of Development and Communications, was recognized for her years of faithful service. Kristi is retiring this summer. Staff members Sara Liegl (Project Home) and Kathy Denman-Wilke (Department of Indian Works) were respected for their 20 and 5 years of service, respectively. But you have also made us humble – from the clay of the Earth. You have made us in such a way that we are incomplete on our own. You have made us like yourself – with a heart. To depend on one another, to nurture each other, for friendship, sisterhood and brotherhood. You have made us with responsibility for each other. It is YOU who gather us – knit us together in and through our service to each other. For the amazing work of Interfaith Action. 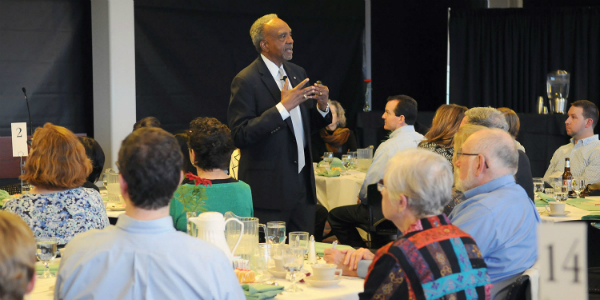 We thank you for Clifton Taulbert’s message that reminds us of the habits of our hearts. Help us to bring respect, affirmation, and inclusion. Give us high expectations for ourselves, for each other, and for our community. Give us the courage and hope we need in our work for justice and peace and the common good of all. Watch the video of Mr. Taulbert’s keynote address. https://interfaithaction.org/wp-content/uploads/2018/11/IA_Logo-1030x335.png 0 0 Kathy Graves https://interfaithaction.org/wp-content/uploads/2018/11/IA_Logo-1030x335.png Kathy Graves2018-05-14 16:12:242019-04-10 13:48:00Annual Assembly Builds "Habits of the Heart"
Eight Habits of the Heart Building Opportunity: What does it mean?